Each of your basic pokemon's attacks does 20 more damage to your opponent's defending pokemon. You cannot apply more than one willpower ability per turn. Flip a coin. If heads this attack does 30 more damage. If tails, this attack does20 damage to itself. Comments : Put this card into your active azelf. 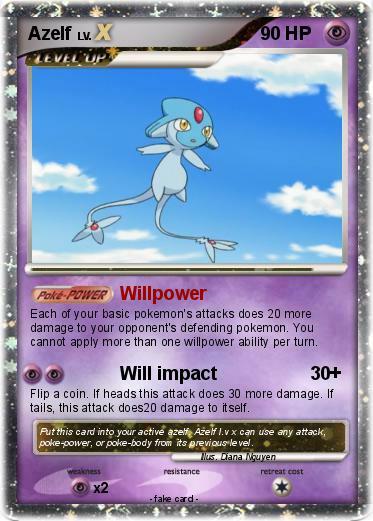 Azelf l.v x can use any attack, poke-power, or poke-body from its previous level.